Ok People! You know me, It's All About The FLASH! 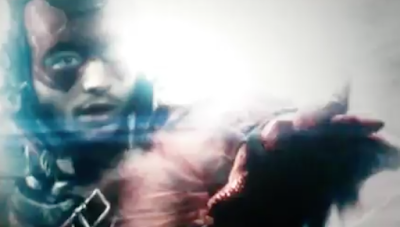 Just came out, so I must talk about the appearance of The Flash in this Movie! of a what looks like Post Apocalyptic World with Superman ruling with an Iron Fist. To have a flashing bright light and figure reaching out to him. BRUCE! Bruce! Listen to me now! It's Lois! Lois Lane! She's the key! Am I too soon? NO! I'm too soon! You're right about him! You've always been right about him! Find us! You have to find us! This is the dire message the Flash gives Bruce. Were you confused? I sure was, and I think... so was Bruce. The FLASH even said it himself, "I'm too soon!" So Lois was not the Key in this movie, but she will be in the future. Put this message from the Flash to the side for now. It's important! And an Easter Egg for Future Movies, but for the moment it will just confuse you. "We need to find the others like her." ... Stopping a convenient store robbery. Seeing him in simple hero mode was a lot of fun! I was very pleased with the clip! The only hope I have for the future with the Flash is that... He cleans up a bit. In this scene, he honestly looks dirty, grungy, and like he's homeless. It seems like most people are against Ezra Miller as the FLASH. After the movie came out, some people are totally for him now. There just wasn't enough to base a decision on him just yet! So are you a Fan of Ezra's Flash? What do you think of the Flash's role in the movie? Are you read for Justice League in 2017, or Flash in 2018?